The steep rock of the Acrocorinth rises to the south-west of ancient Corinth, surmounted by the fortress, also called the Acrocorinth, which was the fortified citadel of ancient and medieval Corinth and the most important fortification work in the area from antiquity until the Greek War of Independence in 1821. It is 575m high and its walls are a total of almost 2,000m in length. Acrocorinth (Gr. Ακροκόρινθος), the acropolis of Corinth, is a monolithic rock overseeing the ancient city of Corinth, Greece. Ιt rises about 1800 feet above the surrounding plain. At the highest summit was the Temple of Aphrodite. It was continuously occupied from archaic times to the early nineteenth century. The city's archaic acropolis, already an easily defendable position due to its geomorphology, was further heavily fortified during the Byzantine Empire as it became the seat of the strategos of the Thema of Hellas. Later it was a fortress of the Franks after the Fourth Crusade, the Venetians and the Ottoman Turks. With its secure water supply, Acrocorinth's fortress was used as the last defending line in southern Greece repelling foes from entering the Peloponnesian peninsula. The highest peak on the site was home to a temple to Aphrodite which was Christianized as a church, then became a mosque. The American School began excavations on it in 1929. Currently, Acrocorinth is one of the most important medieval castle sites of Greece. In a Corinthian myth related in the second century CE to Pausanias (Description of Greece ii. 1.6 and 4.7), Briareus, one of the Hecatonchires, was the arbitrator in a dispute between Poseidon and Helios, between sea and sun: he adjudged the Isthmus of Corinth to belong to Poseidon and the acropolis of Corinth (Acrocorinth) to be sacred to Helios. The Upper Peirene spring is located within the encircling walls. "The spring, which is behind the temple, they say was the gift of Asopus to Sisyphus. The latter knew, so runs the legend, that Zeus had ravished Aegina, the daughter of Asopus, but refused to give information to the seeker before he had a spring given him on the Acrocorinthus." (Pausanias, 2.5.1). Courses of roughly dressed polygonal masonry allow us to suppose that the Acrocorinth was fortified as early as the time of the Kypselid tyranny (late 7th c.­early 6th c. BC). 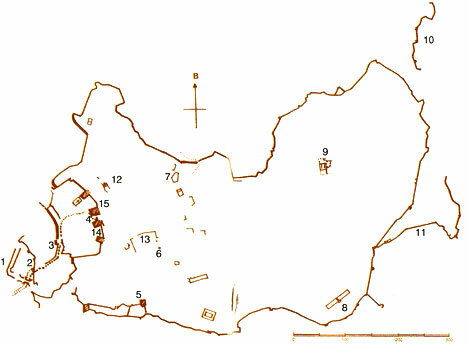 The surviving parts of the ancient fortifications, however, which are at many points beneath the medieval enceinte, belong mainly to the 4th c, BC. In 146 BC, Mummius destroyed the fortifications of the lower city and the acropolis. The destroyed sections were subsequently reconstructed from the same ancient material in Late Roman times. During the Middle Ages, the Acrocorinth was of prime importance for the defence of the entire Peloponnese, and held out against the attacks of the barbarians. The Byzantines sporadically repaired the walls, especially after hostile raids (by the Slavs, Normans and others), and added new fortifications on the west side of the fortress. In 1210, after a five-year siege, the Acrocorinth was captured by Otto de la Roche and Geoffroy I Villehardouin, and was incorporated in the Frankish principate of Achaea. In the middle of this century, William Villehardouin extended the fortifications of the fortress, to be followed in this by the Angevin prince John Gravina at the beginning of the 14th c. In 1358 the Acrocorinth passed to the Florentine banker Niccolo Acciajuoli, and in 1394 to Theodoros I Palaiologos, despot of Mystras, Apart from a brief occupation by the Knights of Rhodes from 1400-1404, the fortress was to remain in Byzantine hands until 1458, when it was captured by the Ottoman Turks. The Venetians made themselves masters of the Acrocorinth from 1687 to 1715, after which it reverted once more to the Turks, until the Greek Uprising of 1821. The approach to the fortress is from the west side, The walls have an 'irregular shape, which was dictated by the form of the terrain and remained the same in general terms from the Classical period to modern times, Three successive zones of fortifications, with three imposing gateways, lead to the interior of the fortress. The fact that the same material was used for extensions or repairs to the walls frequently makes it difficult to distinguish the building phases or assign a date to them. Within the third enclosure wall on the Acrocorinth are to be found monuments of all periods: at the highest point, the sanctuary of Aphrodite with an early Christian basilica on its ruins, the fountain of Ano Peirene, Byzantine cisterns, the Frankish tower, a Venetian church, mosques, Turkish houses and fountains.